Provider: VA Loan Captain, Inc. The VA Home Loan benefit, and the members of the military and veteran community who use it, are unique. It is important for real estate professionals to have a good knowledge of both to ensure their clients receive the maximum benefit possible, and that they do not miss out on this important way to grow their business. How much can you grow your business by becoming VA Loan Certified? In 2015, the VA guaranteed over 630,000 VA loans for a total loan amount of $153 billion. According to the National Association of REALTORS®, 21% of all home buyers and sellers are veteran and military servicemembers. These customers conduct 650,000+ transactions per year, worth over $153 billion. Establishing trust is important with every client, but this is especially true for military customers. This course will cover everything from the history of the VA Home Loan benefit, to a walkthrough of the VA loan process, to dispelling common myths that are held about the VA loan, and finally to how to write an effective offer. We will also give you tips and tricks for working with your military and veteran clients, loan officers, and representatives from the VA. Numerous benefits include preferred status in a national referral network, an exclusive discount on military-focused marketing tools, and more. The V.A.L.C. 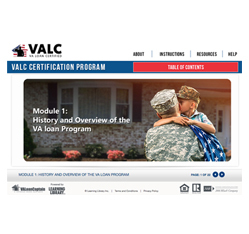 Certification is the most comprehensive educational course for real estate professionals to learn about the home loan programs offered by the Department of Veterans Affairs (the VA), also known as the VA loan. The VA loan benefit, and the members of the military and veteran community who use it, are unique. It is important for real estate professionals to have a good knowledge of both to ensure their clients receive the maximum benefit possible, and that they do not miss out on this important way to grow their business. How much can you grow your business by becoming VA Loan Certified? In 2015, the VA guaranteed over 630,000 VA loans for a total loan amount of $153 billion. According to the National Association of REALTORS®, 21% of all home buyers and sellers are veteran and military service members. These customers conduct 650,000+ transactions per year, worth over $153 billion. Establishing trust is important with every client, but this is especially true for military customers . This course will cover everything from the history of the VA loan benefit, to a walkthrough of the VA loan process, to dispelling common myths that are held about the VA loan, and finally to how to write an effective offer. We will also give you tips and tricks for working with your military and veteran clients, loan officers, and representatives from the VA. The VA Home Loan benefit could provide the best chance many military servicemembers and veterans will have to own a home. This certification will allow you to give our brave servicemen and women the knowledge, information, and support they deserve to help them participate in the American Dream. VA Loan Captain is the leading national education platform and marketplace for veterans to find the best education and rates for their VA loans. As a member of the National Association of REALTORS© (NAR) REach ® Class of 2016, VA Loan Captain is the exclusive partner of the NAR to help REALTORS© attract and work with military and veteran home-buyers. VA Loan Captain also powers VA loan education and marketplaces for some of the leading military and veteran publications. Founded in 2011, VA Loan Captain was created out of the experiences of its founder and CEO, Grant Moon. Grant served in the US Army from 1998, and is a proud veteran of Operation Iraqi Freedom and other operations in support of the Global War on Terror. On returning from Iraq in 2008, Grant was looking to buy a home, and heard about the VA Home Loan benefit. At the time, there was no VA Loan Captain to compare rates and fees across multiple VA lenders or work with a real estate agent familiar with the VA loan. As a result, Grant went through a painful process which cost him more than he hoped, and created a number of issues that could have been avoided. Looking back, Grant wanted to help his fellow veterans by providing them with a simple and unbiased way to educate themselves on the VA Home Loan. Find us anytime at www.valoancaptain.com. Once you have become an expert of the VA Home Loan process, VA Loan Captain wants to help you put your V.A.L.C. Certification to work for you! The Patriot Program is the first and only comprehensive digital toolkit for marketing to the veteran and military community. The platform comes complete with tools and resources for your clients, a custom website, and professionally designed marketing collateral. V.A.L.C. professionals receive 20% off their monthly subscription! Patriot Program members also receive a further upgraded status on the Home Captain Realty referral network.